The BOSS system is not a typical 1-2-3 system, it is a much more flexible concept. This allows you to find the perfect combination of creams & pads to address any specific polishing condition you come across. got to correct it. Best yet, these pads and creams are color coded. With 4 liquids, 5 pad types (and the Innerflex cushioning pad) in two sizes, you have hundreds of unique polishing combinations. 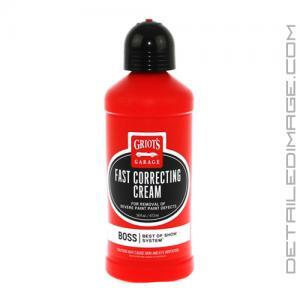 If you are looking for a heavy cutting polish pick up the Griot's Garage BOSS Fast Correcting Cream today! The majority of the vehicles I work on receive a 2-step correction or more, so Fast Correct has really been one of my most-used compounds over the last 6 months. Its cut is on par with most of my other compounds but it has little to no dusting, especially when used with the MF pads, and the long working time is great, making it a very pleasant-to-use compound. Paired with the Fast Cut MF pad I was able to quickly eliminate swirls and even RIDS with some quick, focused polishing on several hard BMW, Audi, and Mercedes paint types. In days past, if you needed a product that would provide good cutting ability for defect removal, it came at expense of sacrificing clarity and gloss. Thankfully many manufacturers have been working to bridge the gap by creating products that can cut nicely while also finishing down better than you might expect. So far, this is exactly what the Griot's Garage Fast Correcting Cream has done for us. I always say that it's impossible to try this product and not like it. If you do not have this product in your arsenal you are definitely missing out. Packed with high loads of sub-micron abrasives, our BOSS Fast Correcting Cream makes quick work of correcting the most severe defects, adding depth and clarity to your paint, and preparing it for perfecting or sealing. Directions: SHAKE WELL. Assess the surface, then select the appropriate BOSS pad. Thoroughly butter the full face of the pad. Working a 2' x 2' section at a time, spread product across entire area. Using light pressure and slow arm speed work product into surface for 3 to 4 passes. Remove residue with a clean micro fiber cloth. Apply 3 or 4 drops of product to pad for subsequent sections. Frequently clean pad face with pad conditioner brush and/or compressed air via a regulatory approved air nozzle. Our number 1 go to for all types of paints and vehicles. Low dusting that has long working time and provides great results. Works well for removing defects with a DA polisher. Long working time and low dust. This is our GO TO product for defect removal, great working time, great results.